Social Security - Do Divorced Spouses have rights? Social Security Benefits - Do Divorced Spouses have rights? Both spouses must be at least 62. However, a spouse younger than 62 can file for spousal benefits if they are caring for a child under the age of 16 who is a dependent of the worker whose work record is funding the benefit. The maximum benefit is limited to 50% of the other spouse’s primary insurance amount (PIA). But just as there is a penalty for filing early for retirement benefits, there are penalties for filing early for spousal benefits as well. But since the maximum amount is 50% of spouses PIA, the penalties can take the benefit down to 35% of spouses PIA if filing spousal benefits at age 62. For example, If a spouse's Primary Insurance Amount is $2,000 a month, a married or divorced spouse who files spousal benefits at their FRA can receive up to 50% maximum of the other spouse's PIA, or $1,000. But if a 62 year spouse or divorced spouse files early, their maximum benefits would be $700 (35% X $2,000 - retired worker's PIA). If you file before your Full Retirement Age (FRA) and continue to work or go back to work before reaching FRA, not only will you be subject to a penalty for early filing, but you may be subject to an earnings cap penalty – you made too much money for that year. If you make over approximately $16K, and you’ve filed early before age 66, you may have your benefits reduced. However, you can make up to approximately $45K through the month you turn 66, and once you reach your FRA, there is no limit on how much you can make. A divorced spouse, once they reach their full retirement age, can also file for restricted spousal benefits only and let their own retirement benefits grow by 8% a year until the age of 70. Now what’s additionally required is that your marriage must have lasted at least ten years, not nine-years, eleven-months, three- weeks, and six days – but 10 years! You must not be remarried. However, there is an important exception to that rule with which many people are not familiar. If you remarry and your new spouse is collecting either spousal or survivor benefits, but not their own retirement benefits, you may be eligible to file for spousal benefits on your ex-spouse even if you remarry. What special advantage do divorced couples have that married couples do not? The feature of Social Security spousal benefits that is available only to divorced spouses involves the ability for a divorced spouse to file for spousal benefits even though the other spouse has not begun receiving their own retirement benefits. For married couples, each spouse must wait until the other spouse begins collecting their retirement benefits. The exceptions to the married spouse rule would be if they’re eligible for restricted spousal benefits, or they have filed and suspended their benefits. Can a divorced spouse file as early as 62 on their ex-spouse’s work record? Yes. Although filing early before a person’s full retirement age will result in benefit reductions (see above chart), a spouse or divorced spouse is eligible to receive spousal benefits at age 62. Can a divorced spouse remarry and still collect spousal benefits? Maybe. Generally, divorced couples cannot remarry and still be eligible for spousal benefits based on a former spouse’s working record. 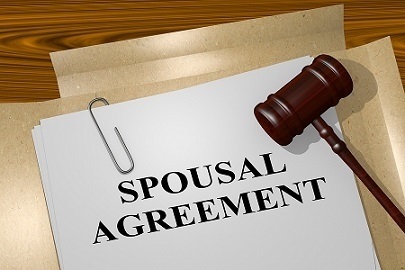 However, an exception exists if the former spouse marries an individual who is only receiving spousal or survivor benefits themselves (not their own retirement benefits). What if a person has been married twice or more and each marriage lasted ten years? A former spouse may file spousal benefits and be eligible to receive benefits based on the highest amount they’re eligible for. Therefore, even if an individual has been married three times, and each lasted at least ten years, he or she may file on the earnings record of the spouse (both spouses must be at least 62) with the higher primary insurance amount. Can a divorced spouse file for spousal benefits while letting their own retirement benefits grow? Possibly. If a spouse or divorced spouse was born on or before January 1, 1954, they may file for restricted spousal benefits, which allows an eligible spouse to file for spousal benefits at their full retirement age while they allow their own benefits to grow by 8% a year until they reach age 70. Can a divorced spouse be eligible for survivor benefits if their former spouses passes away? Yes. As long as the marriage lasted at least ten years and the surviving spouse is at least sixty years-old, she may file for survivor benefits on her former deceased spouse's earnings record. See Survivor Benefits planning page for more information on survivor benefits. Here at Carr Wealth Management, LLC, we realize how important it is to plan for your retirement, and how critical it is to make the right decision regarding your Social Security benefits. After all, the decisions today will impact a stream of income for the next twenty to thirty plus years for people reaching retirement. Please contact us for a no-charge consultation or if you simply have a question you'd like answered.